The right of a public school teacher to wear religious dress or garb would be protected under a bill heard by the Education Committee Jan. 17. Sen. Jim Scheer said religious restrictions on public school teachers are obsolete and should be repealed. LB62, introduced by Norfolk Sen. Jim Scheer, would repeal a law prohibiting public school teachers from wearing religious dress or garb at school. School boards currently are required to suspend for one year any teacher in violation of the laws and termination of employment is required after a second violation. Violations could result in a fine of up to $100 and a sentence of up to 30 days in county jail for a teacher. School board members who fail to report a teacher’s violation would be guilty of a Class V misdemeanor, which could result in a fine of up to $100. Scheer said he introduced the bill after learning of Sister Madeleine Miller, a Norfolk nun who was told she would be unable to wear her habit as a substitute teacher in the public school system. He noted that 34 of 35 states that had passed similar legislation have since repealed it. 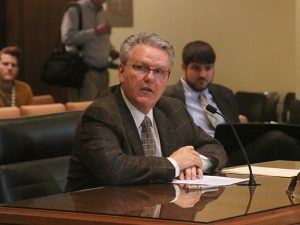 “I’ve been around education for a long time and I had never heard of this [statute],” he said, adding that many teachers may be in violation of the law without knowing it. Martin Cannon, representing the Thomas More Society, testified in support of the bill. He said the original statute is based on a flawed idea. Representing the Nebraska Family Alliance, Nate Grasz also supported the bill.